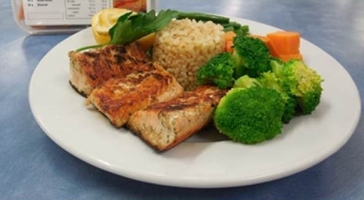 Easy Health Meals are suppliers of fresh and healthy meal options to the health and fitness industry. After a quick lunchbreak work out, Easy Health Meals help you fit in a healthy lunch when time is limited. At the end of the day fitting in a work out is great but takes the mindspace & energy away from focusing on making a health meal for dinner. Easy Health Meals eliminate the danger of unhealthy meal choices late at night. Being healthy is easy with Easy Health Meals. Only Available In-Store. Look For It In the Refrigerator. Chicken with Rice. Comes in Herb Garlic, Portuguese, Peri Peri, Lemon Pepper.